An osteochondral defect (OCD) to the talus is an injury of the talar articular cartilage and its subchondral bone. The injury can rigorously affect daily activities of patients leading to a deterioration of the quality of life. Despite substantial research having been conducted in the past number of decades, there is still no worldwide consensus on the optimal treatment protocol for primary and secondary symptomatic talar OCDs. 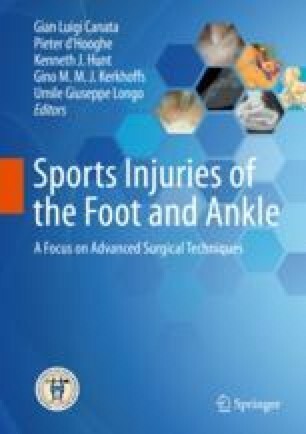 In this chapter we present the historical perspective and we describe a novel arthroscopic internal fixation procedure for the treatment of talar OCDs, known as the “Lift, Drill, Fill, and Fix” (LDFF) technique.